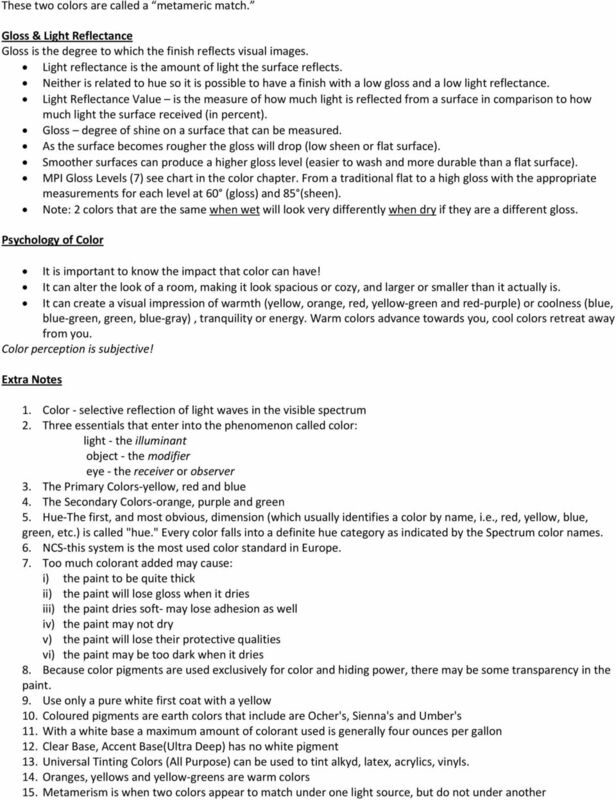 1 Important Notes Color Introduction A definition for color (MPI Glossary) The selective reflection of light waves in the visible spectrum. Materials that show specific absorption of light will appear the color of the wavelength that they reflect. Color has a definite effect on emotions, and influences to a marked degree the health of an individual. Three essentials to color: Light the illuminant Object the modifier Eye the observer or receiver Light What is Light? Light is the source of color. Light, according to modern science, is electro magnetic energy and comes to us in waves of varying lengths but all traveling at the same speed. Colors will appear different under different light sources. The light of sun in normal daylight is white, and is composed of a visible spectrum of colors (red, yellow, green, blue and violet rainbow colors). How do we see color? Light has all the colors in it. Every object has the ability to reflect parts of the colors and absorb the rest (i.e. when a person sees red, all the colors except red are absorbed into the surface and not reflected). Black is the complete absorption of available light (that s why black absorbs heat energy). White is the complete reflection of available light (if the light source is white the object will appear white). Color Theory Three primary colors Red Blue Yellow Secondary colors (complimentary mixtures of 2 primary colors) Orange Violet Green Tertiary colors (combining primary and secondary colors in equal amounts, earthy colors) Red orange Yellow green Blue violet Red violet Yellow orange Blue green Three Dimensions of Color Hue: Identifies a color by name, every color falls into a definite hue category. 3 White Base Neutral or Pastel base Deep Base (Accent or Ultra Deep Base), Clear Base A few examples of how to better hide with deep or accent bases: Yellow: use a pure white first coat (no marks or blemishes on the white coat) and then apply 2 coats of yellow. Orange & Red: use a burnt sienna or red oxide mixed in a neutral base, producing a reddish brown first coat. This allows the orange to cover better. Blue, Green, Black, Red: These colors usually cover quite well but there should still be a first coat that is similar (but slightly grayer) to provide better hide. Most manufacturers will produce a compatible primer or undercoat to go under these darker colors; but always remember that blemishes, roughness, scratches and poor application will show up dramatically. Proper surface prep and proper sealing of the surface is imperative for a successful job! Color Pigments One of the prime functions of paint is to impart color to a surface. Color pigments come from the earth, from chemicals, from vegetable dyes and from animal bones. There are many types of color pigments but here is a list of the common earth colors: Raw Sienna Burnt Sienna Red Oxide Golden or Yellow Oxide Raw Umber Burnt Umber Chemical colors include: Blues Phthalocyanine blue Yellows Hansa yellow (light) Green Light green and Phthalocyanine green Reds Napthol red and interior red Orange Lamp Black Titanium White Purple Points to Remember Always choose the correct base for tinting (3 bases white, neutral, clear or accent base). Choose the correct type of liquid tinting color. 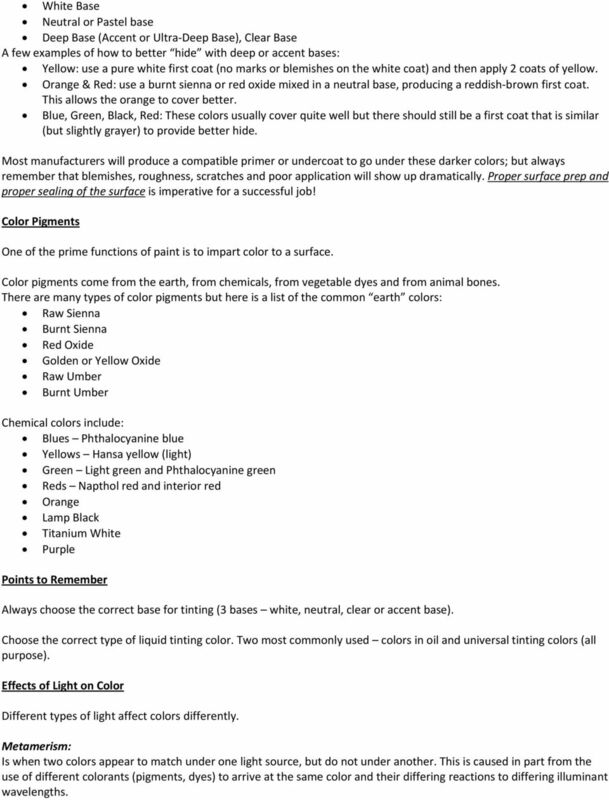 Two most commonly used colors in oil and universal tinting colors (all purpose). 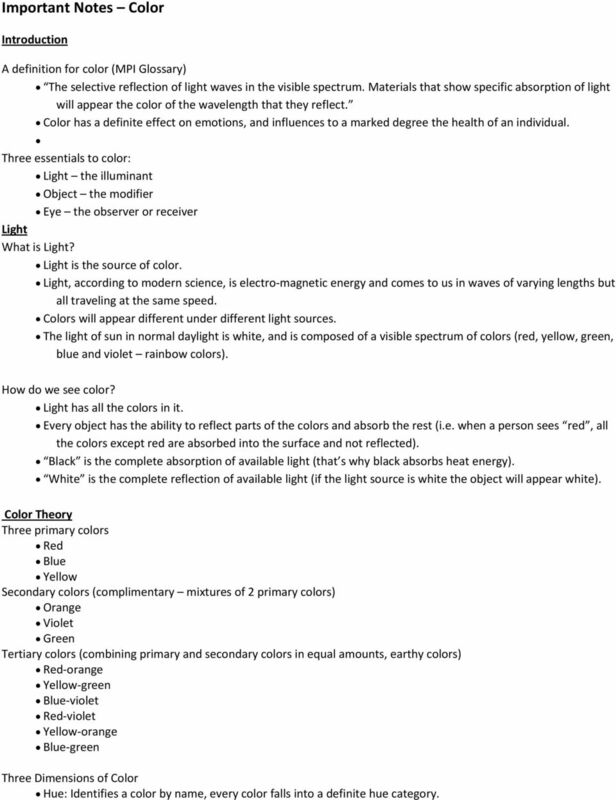 Effects of Light on Color Different types of light affect colors differently. Metamerism: Is when two colors appear to match under one light source, but do not under another. 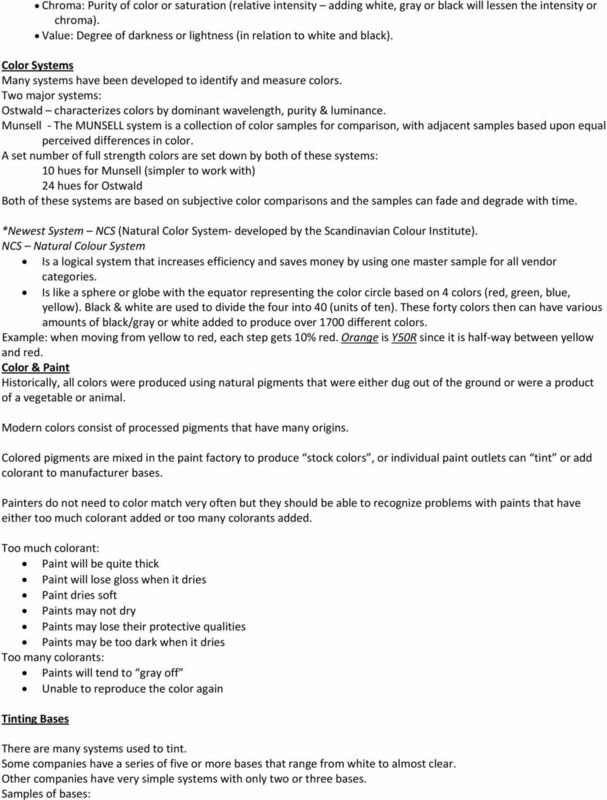 This is caused in part from the use of different colorants (pigments, dyes) to arrive at the same color and their differing reactions to differing illuminant wavelengths. 5 16. Light reflectance value is the measure of how much light is reflected from a surface in comparison to how much light the surface received (in percent) 17. A very dark surface absorbs light like a sponge and reflects only a small amount of the light 18. Gloss & Sheen are 60 and 85 degrees 19. Psychology of Color 1. can alter the appearance of a room can highlight architectural flaws or hide them 2. can create a visual impression of warmth or coolness, as well as a feeling of tranquility or energy 20. Greens are mostly "cool". 21. Yellow, orange, red, yellow green and red purple are classified as warm colors. 22. Blue, Blue green, Green, Blue gray are cool colors. NOLIFT HIGHLIFT. Cool Blonde. Biege Blonde. CB Cool Blonde. Golden Blonde. BB Beige Blonde. GB Golden Blonde. Red Orange. Red Red. UV Fluorescent Testing or Xenon Arc Testing. The Right Choice.